The day had finally arrived--time to meet their new teachers! Sneak-a-Peek started at 5 but parking is an issue at our school, I was ticketed once during the Christmas celebration. So we arrived at 4:45 so we could at least have somewhat of a close parking spot. We lucked out too, right next to the side of the building in the car rider line---there was no picking up and dropping off happening so we followed the car in front of us, who was following the car in front of them and we just parked! We hopped out and go in the line that was already about 100 deep. As we stood there, the boys started searching for their friends and running up to say hi. Smiles plastered on their faces. 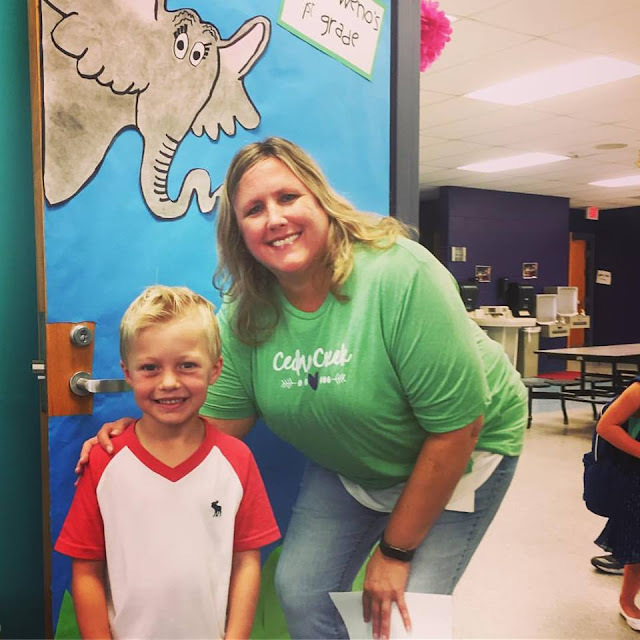 Once they opened the door we headed to their classrooms--Logan's first and then Kaden's but not before we said our hellos to our favorite kindergarten teacher -- Miss Timmerman. We were fortunate enough to spend the last two year with her since both boys drew the lucky straw and were in her class. Kaden ducked into Mrs. Downing's room to pick up his summer reading program treat and to say hi as we took Logan further down the first grade hall to his new classroom and to meet his teacher. 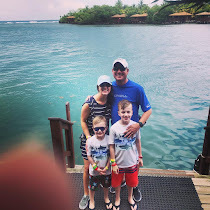 Mrs. Kleweno was there with a big smile and as soon as Logan said his name, she knew exactly who he was and also that he had an older brother named Kaden. Still not sure if that was a good sign or not but Logan took his name tag and picked out where he wanted to sit for the first two days of school. We quickly worked through the welcome back packet, said our "see ya tomorrow" & headed across the hall. Yup, the boys are literally right across the hall from one another, share a bathroom and water station too. 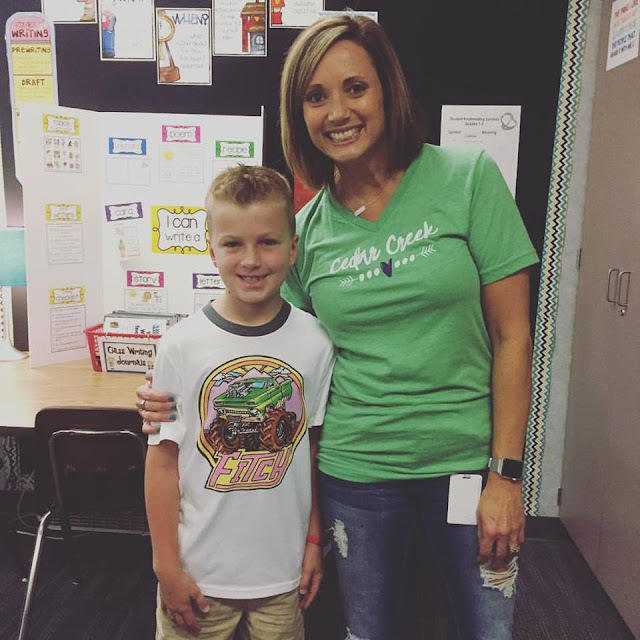 Kaden was a little shy when he first walked into Mrs. Vohs room but he quickly saw a few of his friends and the nerves were gone. He found his seat, right next to Kendall who was in his class last year & we started to work through his checklist too. It didn't take as long as we thought it would have since the kiddos were going to sort through it all the following day so we signed that he was a bus rider and off we went. We had baseball practice to get to. I know they'll always be my babies but it's days like this that hit me pretty hard. I sit back and look at these pictures, I mean they're first and second graders now. 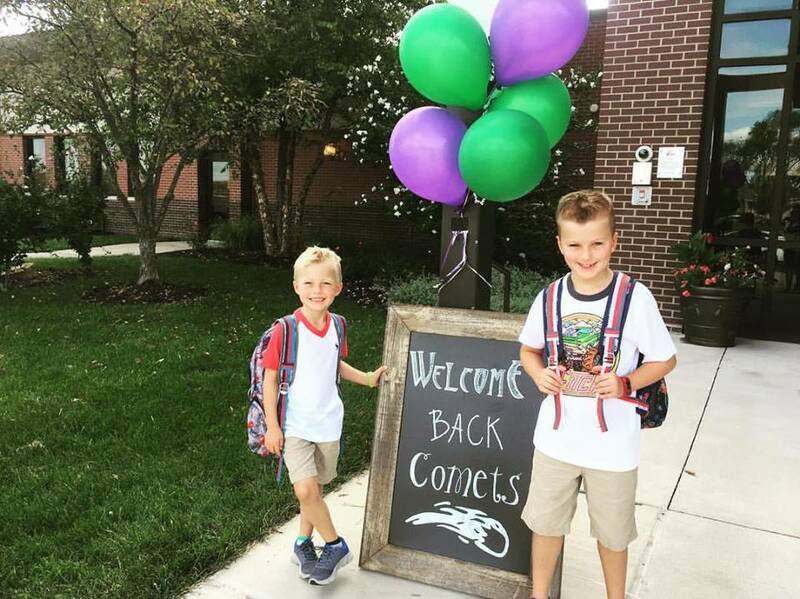 FIRST and SECOND GRADERS! They are getting so big, so quickly and every day they seem to need me a less and less. You better believe that I am taking full advantage of all hugs, snuggles, kisses and piggyback requests while I can because I am going to blink and they'll be driving off to college.